I’m sure that you must’ve used Zomato quite a few times for restaurant rating. Well, previously it was named as Foodebay.com. Here’s a quick discussion that I’ll let you know about it. The most prominent food review website of the world was once infringed due to copyright claims by the largest e-commerce website eBay as it had the name on their website as well. Th only point that I am trying to convey is that you’ve to pretty backed up and should be prepared to protect your company as there’s always a real chance to the infringement of a company’s assets, trademarks, and patents of various entrepreneurs like you. Since the growing trend of startups and online businesses is rising exponentially in India, there’s a chance that one of us guys might face this problem. Fortunately, I’ve recently encountered a startup that comes to rescue all the copyright registrations related stuff for other startups online. QuickCompany is a New Delhi based startup that is founded by a guy who faced many hurdles while registering his startup once. To save others, he established this idea and asked all the growing companies to leave their registration, patent, trademark, etc. to them. The QuickCompany website seemed to be quite straightforward and user-friendly as every service offered for the startups was boldly mentioned on the site. The homepage features a dedicated Search Box where you can find all the registered companies, trademarks, and copyrights. The company has mentioned all the necessary pricing for the various services offered on the website. Therefore, you can easily rely on this site. Apart from the trademarks registrations, QuickCompany provides an exceptional customer support for all the business owners. The ever- growing knowledge base on the website makes you aware of all the new news, information, changes and amendments made in the laws related to businesses, companies, trademarks, taxes, for any growing startup and business firm. The QuickCompany offers the following premium services for all the different kind of companies, firms, agencies, startups, and large scale businesses as well. 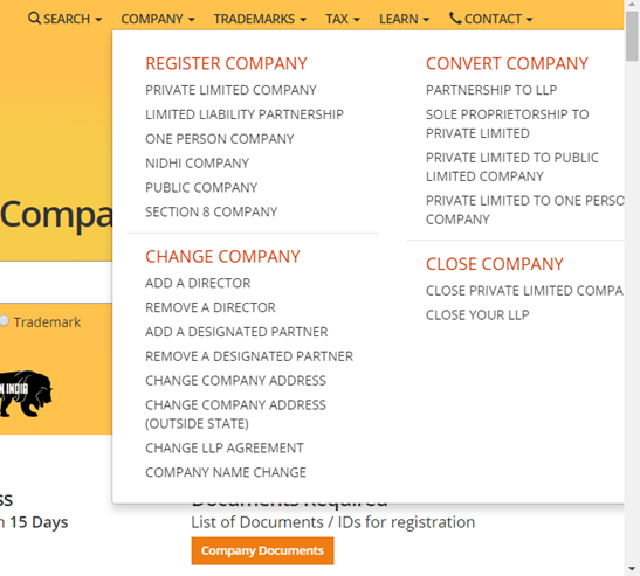 The company registration process starts at as minimum as Rs. 7999 with all the necessary documents. Now, if you’re planning or want to register your innovative idea into a fully functioning company or business, then you can use the registration services. A trademark provides you with a distinctive identity for all your business processes, transactions, and other registration related stuff. Moreover, it also protects you from incurring any damages. QuickCompany offers Trademark Registration and Objection; you can assign a Trademark and renew your expired Company Trademark as well. The website has clearly mentioned all the required documents, filing duration of the process the payment fees directly on their website, so there’s a full transparency between the company and all the potential clients. Whether you’re going to transfer your address or planning to add a new founder to the company, converting your startup from an LLP to a Pvt. Ltd, the websites assists you in all your business handling with its services. The legal and financial requirements of a growing company never stop, that’s why you’ll have to take care of all the taxes related. It is most important for all the E-Commerce or Goods related businesses as you need to be transparent with all your payments and expenses with the government. 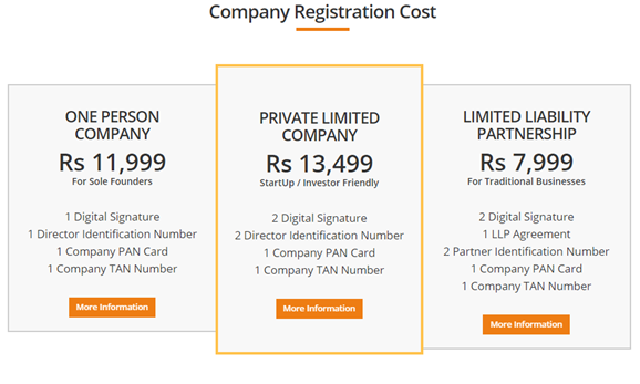 QuickCompany helps you to expand your business as it commences all the taxation related stuff for the companies, and registrations of businesses if their turnover is more than 9 Lacs. As everyone is already aware of what a Copyright is, this physical proof to protect one’s work, assets, and other valuable objects can’t be used without the permission of the owner. Therefore, if you’re in an industry like music, tech, drama, films, writing, etc., then you must’ve realized the importance of having a legal copyright of your work for distribution and usage purpose. All the prices are mentioned later in the article. Moreover, the Design registration process is accustomed to own the full legal rights of someone’s designs and creations. QuickCompany offers an excellent source of information, laws overview and other necessary information on their forums and website for the ease of all the growing startups. There’s also a Money Back Guarantee for the clients if you’re not satisfied with the services. So, this was all about the QuickCompany website. Do share your thoughts and let me know if you’re planning to start something of your own. You can always contact the Customer support team; the guys are very friendly and would guide you out through the whole process. I’ve used the services for one my content marketing company, and within 15 days, I’ve got it registered without any issues or hassles. Cheers!